I prefer real life in person window shopping over Internet Window Shopping. But I really needed a rest this 4th of July Weekend so I tried the relaxing in-home version of window shopping and ended up finding many High-End-Luxe Sneakers, Shoes and Hi-tops. Without reading anyone else’s trend opinion for the Fall 2013 season, I found High Shine Leathers, Patent Leather, & Black to be my favorites. Might be because that’s what I would like to wear or the fact that my feet really hurt. Either Way I made it through the Window Shopping without buying any new Kicks. I was very close a couple of times, but figure I can just look around my condo and find a new pair or two to wear this Summer & Fall. If you like anything here, many can be found on mrporter.com LN-CC shoes or check out all the major designers on The Cut. These exemplify Many of my chosen Hot trends perfectly. High-Shine, Black and Nice soft comfy Leather. They also take an excellent que from Nike’s clear and Ice soles. Check out the transparent soles on these babies. Sweet! 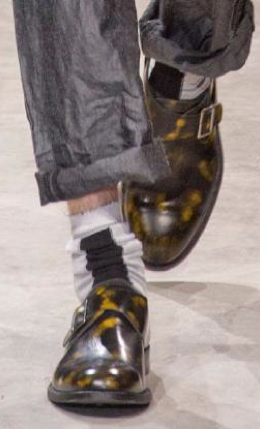 And they have just a bit of Subtle blue on the heel, the color for of the Summer and yet another big trend I’ve been seeing on Men’s shoes over the last couple of years-the interesting slices of colorful soles in Yellow, Blue, Orange, Red and Purple. 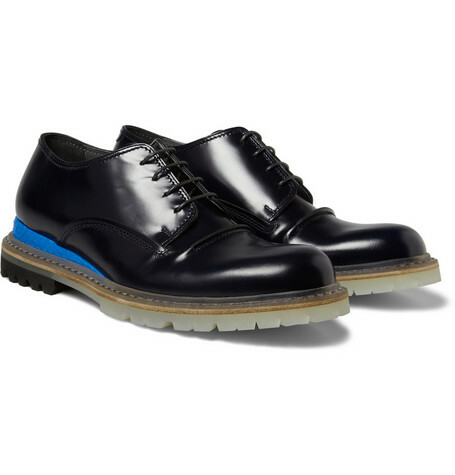 Lanvin Men’s snake-skin Panel Derby shoes in Midnight Blue (My favorite color other than Black) $1,123 on sale for $787. Even though these are low tops, I still like the black canvas and patent leather. They look sleek, slick and probably just as wearable out on a Saturday night as to work on a Monday morning. 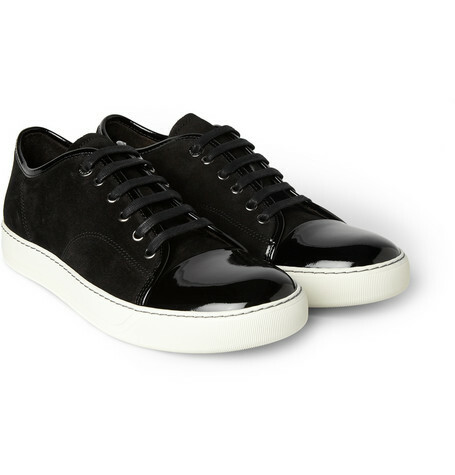 Lanvin Deacon Canvas and Patent Leather Sneakers in Black: $765. This is the first pair that caught my attention on my Luxe Kicks internet window shopping spree. Elegant Crocodile with soft leather construction and a slightly faded outer portion for that perfect worn in look. 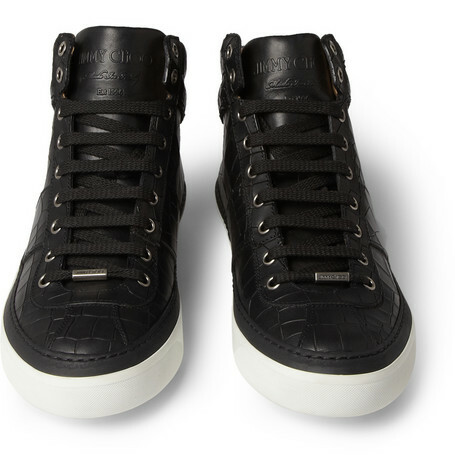 Belgravia Crocodile-Embossed High-Top Sneaker in black.$765. Same pair of Kicks just different color-way. 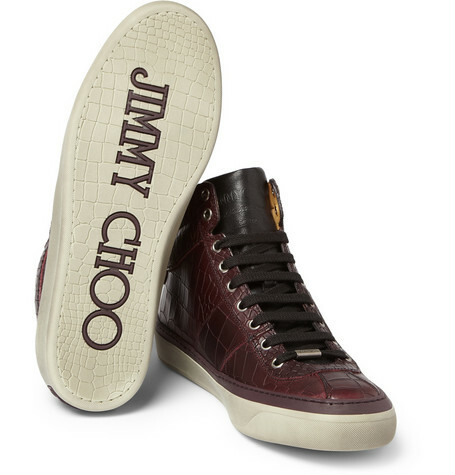 Belgravia crocodile-emobossed High-Top. Rich Burgundy $765. Very understated yet full of style. This would most likely be my favorite of the pack. Even though I have every shade under the rainbow of kicks in my room, I tend to wear the more comfortable and less attention grabbing the most. I like the gold Saint Laurent label at the top of them. I wouldn’t mind wearing these to work sometime. When did the Brand stop using Yves at the beginning of their title? I’ve noticed a lot of Saint Laurent branding over the last couple of days. 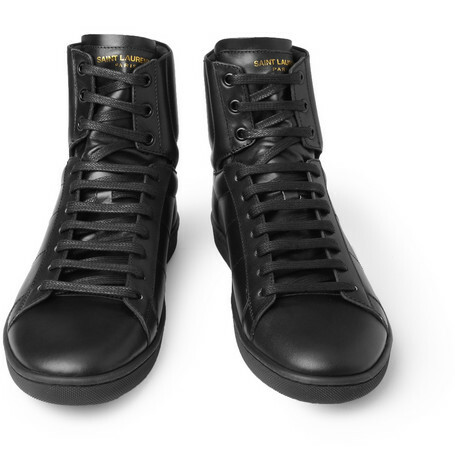 Saint Laurent SL01H High-Top Sneakers in black. $575. These would be my choice to purchase when I get a “Bonus” at work or design the next big “App”. Luxurious, attention-getting, one of a kind and very good-looking. Black suit, Black T-shirt, Black Socks and these is all you need. 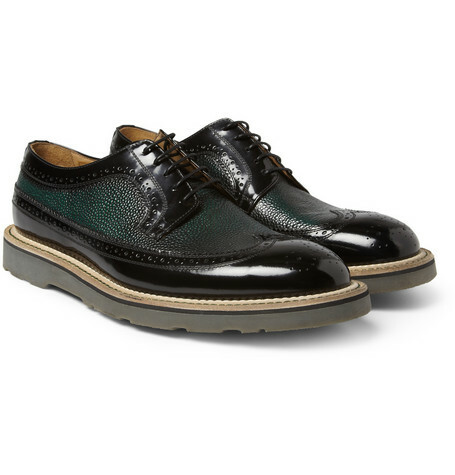 Paul Smith Grand Longwing Leather brogues with rubber sole/High Shine Black with Full Grain leather Green. 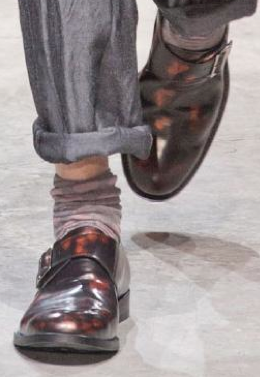 $560 Also check out Paul Smith’s Bronze High Shine Grand Brogues. I totally dig this color-way. $586. These would be the “Teaser” shoes for today. 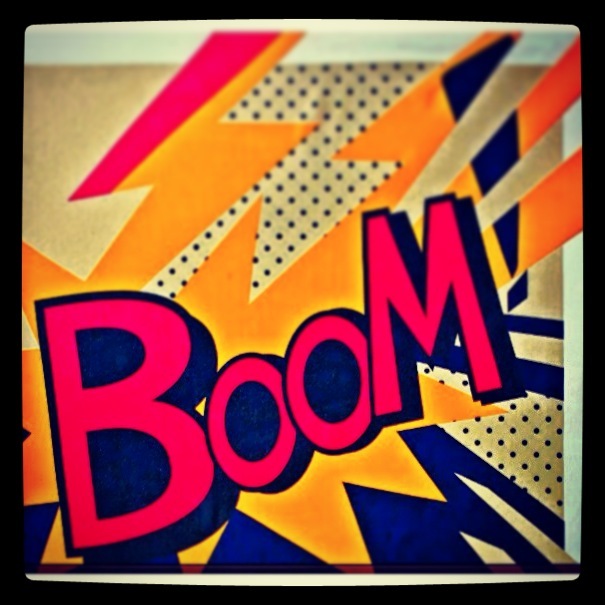 Spring 2014! I’ve seen these before in one of those $175 Fashion mags and now I found them on The Cut. Something to look forward to once we’re done with the black/Patent/High Shine or last year continuing through this year’s very colorful soles. Buckled Cat patterns in a Nifty gloss to be worn of course…without socks. Hope you enjoyed today’s Shoe’s & Kicks Fashion Show. Can’t wait to buy my own High-Shine Shoes, maybe in September? Next Post will feature LoveFest 2013 coming up in June on the island of Oahu. Until then .. Have a great time on the Streetz of Summer 2013.